Welcome to Budapest, capital of Hungary. Transfer to your ship from the airport. * After boarding, the afternoon is yours to relax or do a bit of exploring. After dinner on board tonight, enjoy an evening cruise on your ship to admire Budapest’s beautiful scenery from the vantage point of the Danube River. Your morning begins with a panoramic tour of the Pest side of the city. Journey along Andrássy Avenue and see the 19th- and 20th-century mansions, National Opera House, Parliament Building and Chain Bridge. Stop in Heroes’ Square to learn more about Hungarian history, then cross the Danube to Buda’s Castle District. Visit Matthias Church and enjoy brilliant views of the Danube and the beautiful Hungarian Parliament building from Fishermen’s Bastion. Rejoin your ship in Visegrád for lunch as we cruise along the scenic Danube River. Enjoy a midafternoon Viennese coffee workshop, complete with apple strudel. Today we tour the Austrian capital of Vienna. Ride along the Ringstrasse, which replaced the city walls in the mid-19th century. See some of the city’s baroque architecture, including the world-famous Opera House, St. Stephen’s Cathedral and Hofburg Palace. Return to your ship for lunch. The rest of the day is yours to further explore. As always, your Program Director can help you plan your free time. Or, you may choose to join us for an optional excursion. Perhaps visit Schönbrunn Palace, erected in 1778 and admired as the “Versailles of Vienna,” or go behind the scenes at the Spanish Riding School to see its famed Lipizzaner stallions. This evening, you might enjoy an optional classical concert or celebrate the bottling of this year’s wine vintage among the locals at a high-spirited optional Heurigen dinner. After breakfast, disembark in Krems and set off for Göttweig, a working Benedictine abbey that owns many of the vineyards along the Danube. See the splendid ceiling fresco in its imperial stairwell, one of the largest in the world. Visit the abbey church, a masterpiece of baroque architecture. Alternately, you may instead choose to explore your environs by bicycle, enjoying a ride along a riverside bike path considered one of Europe’s most scenic. Afterward, rejoin your ship and cruise leisurely through the captivating Wachau Valley, a UNESCO World Heritage Site. Taste some local Austrian specialties during lunch on board, taking in views of attractive towns and castle ruins along the way. Arrive this morning in Passau, at the confluence of the Inn, Ilz and Danube Rivers. Your guided walk along the town’s narrow streets takes you through Old Town and past traditional patrician houses. See the New Bishop’s Residence and visit the impressive baroque St. Stephen’s Cathedral with its ornate interior. Inside, you are treated to a special concert played on the 17,000-pipe organ, considered Europe’s largest church organ.† Enjoy lunch on board your ship, and return to the city for further exploration on your own before departing. Alternately, you may instead journey into the countryside on an optional excursion to a local farm where you will have the opportunity to join a festive Bavarian party, experiencing traditional German music and food and tasting locally brewed beer. 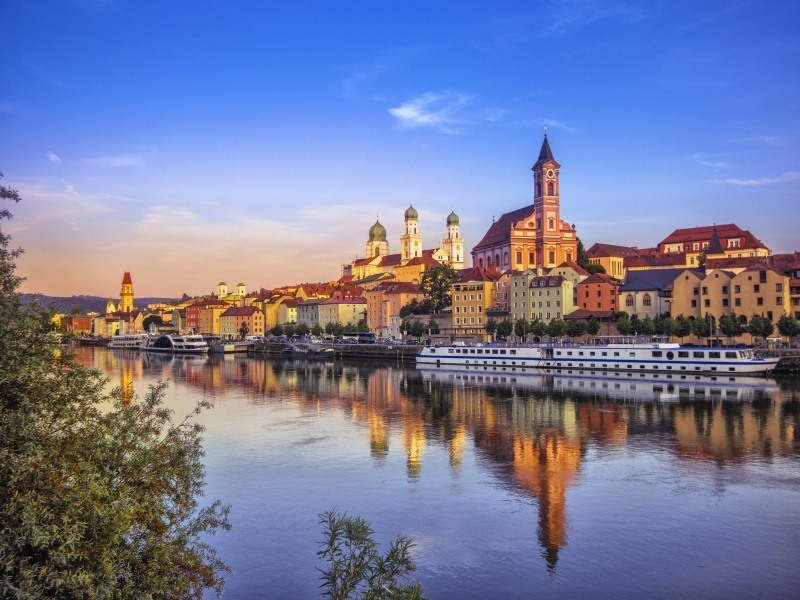 Or, you may choose a full-day optional excursion to explore glorious Salzburg; visit the Italianate Old Town, see settings from the film The Sound of Music and enjoy lunch at Austria’s oldest restaurant. This afternoon, enjoy scenic cruising along the Danube River, or take an optional excursion to visit Weltenburg Abbey and experience a short cruise through a stunning mountain pass, one of the most breathtakingly scenic bends in the Danube Narrows. Travel by road to Kelheim and board a ferryboat to explore the 400-foot chalk cliffs and dramatic scenery of the Danube Narrows. Visit Weltenburg Abbey*, renowned for the dark ale brewed here by monks since 1050, then rejoin your ship in Kelheim in time for dinner. Alternately, you may choose a full-day optional excursion to see the highlights of the grand city of Munich. Alternately, you can join an optional World War II tour. Visit Zeppelin Field on foot, see Congress Hall and spend time at the illuminating Documentation Center Museum. After, visit Courtroom 600 at the Palace of Justice (unless court is in session) before heading to Nuremberg’s medieval Old Town, enclosed within ancient city walls. After breakfast, disembark and proceed to the airport for your return flight. * Or, extend your journey with 3 nights in Prague, Czech Republic, including a tour of Old Town and Prague Castle.